Diamond sharpening kits are popular with woodworkers and are fast-becoming a must have addition to any tradesman’s tool box. Keeping chisels, saw blades and other tools sharp ensures your tools remain effective for longer. Diamond stones provide extra flatness and toughness compared to inferior stones. A quality stone is a bigger investment initially but will last much longer. Whether you’re new or experienced in honing, diamond stones enable users to achieve consistent results with flat-backed and square-edged tools. By choosing a diamond sharpening kit, you will receive either a non-slip mat or bench stone holder. This makes the stone more secure during use. The honing guide is suitable for gripping dovetail chisels, plane irons or blades with a thickness of less than 7mm. Using the setting plate, users can adjust the guide to the preferred profile angle. The brass roller keeps the guide stable as you work it over the stone, providing a quick and consistent finish. 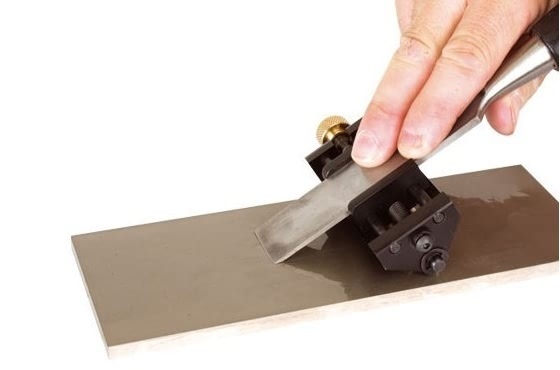 This method of sharpening combined with using a diamond stone delivers fast and repeatable results every time. The most complete of the three, Kit B, enables users to sharpen, hone and polish tools to a consistently high standard. The kit includes an 8×3 inch double-sided diamond bench stone, Honing guide and honing compound kit, with 100ml of lapping fluid. Visit your nearest Anglia Tool Centre showroom to try Trend diamond sharpening kits first hand.